Each set comes basically as shown for $47.95. 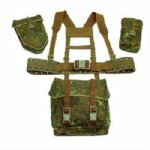 All kits include the belt, shoulder harness and large backpack! Also included are three smaller pouches, normally a couple magazine pouches and a tool pouch. Small pouches vary from batch to batch due to availability.